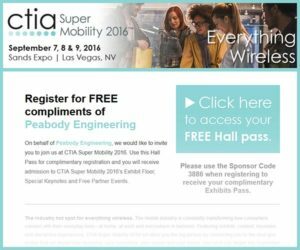 Free CTIA Hall Pass Registration Ends Soon - Peabody Engineering & Supply, Inc.
Haven’t registered yet to attend CTIA Super Mobility 2016? Well what are you waiting for?! Click the button below to register and receive a complimentary Exhibits Pass. This pass allows three-day admission to the Exhibit Floor, CTIA Keynote sessions and free partner events September 7-9, 2016. You must complete your Registration by August 29, 2016. After that the Hall Pass offer becomes null and void and you’ll end up paying for a pass. Registration for the Hall Pass will NOT be accepted on-site or after the August 29, 2016 expiration date. So be our guest – click the register button below and get yourself registered for free for this event. Stop by booth #4452 and let’s talk about how we can help with your next cell site concealment project.